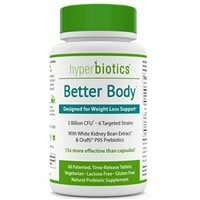 I gave HyperBiotics Better Body a 4 out of 5 stars. I’m pretty impressed with this product because it seems to go the extra mile. It’s super allergy friendly and is free of lactose, yeast, gluten, soy, iron, wheat, nuts, and sugar. It’s vegetarian, non-GMO, and doesn’t use any artificial colors, flavors, or ingredients. It uses a time-release formula (BIO-Tract) that releases the probiotics over an 8-10 hour period, which allows them to survive your stomach acid and get to your intestinal tract. You also don’t have to refrigerate the bottle, so it’s really convenient to store. This probiotic is designed for weight loss support and uses ingredients and strains that have been shown effective for this such as Lactobacillus gasseri and Lactobacillus rhamnosus. It includes a prebiotic, which helps feed the probiotics, and a unique White Kidney Bean Extract to help block the absorption of carbohydrates. I didn’t personally see any major weight loss effects, but my belly was flatter and less bloated. I can see how it would work to reduce weight, especially belly fat, in the long term. I really like this probiotic but there are a few things that held me back from rating it higher. For one, it’s super expensive. It’s almost $28 for a bottle that will only last you 15 – 30 days. If you want more intense digestive support or weight loss support, I recommend taking 4 tablets per day as suggested (which equals only a 15 day supply). Luckily, the company gives a 100% money back guarantee, so that’s a huge plus. The directions say to take 2 tablets ideally before a starch-containing meal and 2 tablets twice daily for intense support. Taking 4 tablets a day was a little much and I would rather just take 1 and be done. I’m not a huge fan of tablets to begin with, but these aren’t too bad. Just swallow them one at a time and with a glass of water. Overall, I think it’s a good probiotic that may help support weight loss and digestion. Better Body has 5 billion CFU in 6 probiotic strains. It also has a few other key ingredients that I’ll get to in a second. As far as the probiotic strains, I really like that it uses Lactobacillus gasseri. This specific strain has shown promising weight loss effects in several research studies. Lactobacillus gasseri has been shown to help lower body weight, abdominal adiposity, BMI, and waist and hip circumferences. This strain was particularly effective at lowering abdominal visceral and subcutaneous fat aka belly fat. This probiotic strain has similarly been shown to help reduce body weight, fat mass, and weight gain. It may also lower the chance of antibiotic related diarrhea, help with Irritable Bowel Syndrome (IBS) symptoms, boost immune function, and prevent gastrointestinal infections. I like that this formula includes Orafti P95 (FOS), which is a prebiotic that helps feed the friendly bacteria. It also has 500 mg of White Kidney Bean Extract. This extract has been shown to be a carbohydrate blocker and inhibits the digestion and absorption of starches. In turn, it may lower the caloric impact of starchy foods and reduce glucose response and glycemic index. This probiotic really sticks out (in a good way!) when it comes to allergy concerns and ingredients. It’s a very natural, allergy friendly supplement. Also, there aren’t any preservatives, artificial colors, or flavors. This probiotic supplement is 100% vegetarian and non-GMO. It does say that there may be trace amounts of the milk protein, casein, from the fermentation process, but that the formula is lactose free. Other ingredients include: Microcrystalline Cellulose, Hydroxypropyl Methylcellulose, Pectin, Sodium Carbonate, Stearic Acid, Guar Gum, and Turmeric (color). For a 60-tablet bottle of HyperBiotics Better Body, it costs $27.97. If you’re taking this probiotic for daily support (2 tablets per day), it comes out to $0.93 per day. If you’re taking it for a specific ailment or intense support (4 tablets per day), it ends up being a whopping $1.86 per day. Both of these uses are more than your average probiotic supplement, especially if you’re taking it for intense support. Just as a gauge, anything over $1 per day is pretty expensive in the probiotic world. At least you have a guarantee backing your purchase if you ever aren’t happy. I think it still ends up being a good value for the price. I’m really happy because I didn’t see any negative side effects. This product is super allergy friendly and not overly potent. I felt good the entire time I took this probiotic. HyperBiotics offers a 100% money back guarantee. If you’re not fully satisfied, for any reason, they will immediately replace your bottle or fully refund your purchase. I love to see guarantees like this one! It doesn’t specify any time restraints, so if you’re curious just contact their customer service department through email or phone. To buy HyperBiotics Better Body, click here.